This special card is offered exclusively to educators who live and/or work in Cleveland Heights or University Heights. It allows cardholders to supplement their curriculum with an abundant, ever-changing supply of books on a range of subjects and reading levels. Invite one of our librarians to come to your daycare or preschool to share stories, songs, and fingerplays with your students. Our librarians also visit Cleveland Heights/University Heights Elementary aftercare programs once each month for stories, songs and movement. To schedule a storytime visit, please email us (see staff list below) or call (216) 932-3600 ext. 1293. We also provide small collections for Cleveland Heights/University Heights Daycares and Preschools of up to 25 books which we rotate every 6 weeks. Collections are based on teacher requests. For more information, email us (see staff list below) or call (216) 932-3600 ext. 1293. Books sets are useful for teachers, book discussion groups or families that want to read together. Multiple copies of a title that can be checked out all at once. To order book sets, email us (see staff list below) or call (216) 932-3600 ext. 1293. See a list of book sets. Are you an educator looking for unit materials to supplement your classroom? 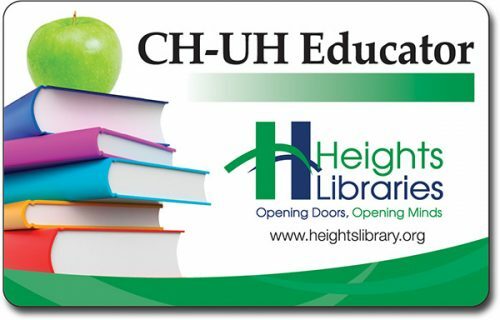 Do you have, or are you eligible for, a Cleveland Heights-University Heights Educator Card? Then Book Requests for Educators are for you! Staff in the Youth Services Department will collect up to 25 books on the subject(s) of your choice for your classroom, Preschool through 12th grade. To obtain an educator collection, we require customers to submit a request online. Materials will be charged to your Educator Card number. Need help? Contact one of our friendly Youth Services Librarians for assistance.